What new things can you say about a game that has been so comprehensively lauded, discussed and analysed as Shadow of the Colossus has? There is already a wealth of information out there about the game, which for many was the first title that offered substantial proof that games from a major studio, working to large budgets could have real and abiding artistic credibility. This is now the third time that the game has been released – once on PlayStation 2, a HD remaster on PS3, and now an enhanced re-release on PlayStation 4. All I can really say is that it remains as potent and poignant as ever. Related reading: Shadow of the Colossus is even more beautiful in black & white. I’ll quickly touch on the new stuff that has been added to this version, because Sony’s selling the game on it being a proper rebuild rather than just a HD upscale, and while this stuff is ultimately quite superficial to why the game is essential, it is why some will look into buying it. It is indeed gorgeous with the full recreation of art assets and high definition graphics. Play it on a PS4 Pro and you get the choice of playing it with maximum graphical fidelity or a silky smooth frame rate. Play it on a regular PS4 and it’s still breathtaking in its attention to detail and design, and it genuinely looks like a native PlayStation 4 title, and not something that was originally released on PlayStation 2. 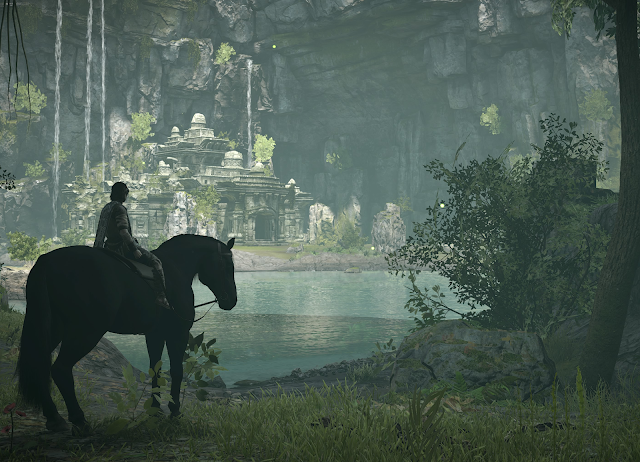 Shadow of the Colossus is a game in which the art direction is more important than the level of technical detail in it, but with this particular release you get the best of both worlds. I don’t remember the gameplay of the earlier versions of Shadow of the Colossus with perfect clarity, but I do remember wrestling with the camera much more than I have this time around. The development team seems to have tweaked things there to make the game more playable, and it’s the better for it. Finally for the new features, and most importantly for me, the game includes the same comprehensive screenshot options that Sony’s games from 2017 did. Horizon, Uncharted: The Lost Legacy, and now this all give players the ability to pause the game at any moment and make full 360-degree use of an in-game “camera” that has all the features that you’d expect of a decent SLR camera in the real world. As a photography enthusiast, I love these camera modes, and the kind of shots they can create, and it feels fitting that a game of the artistic credibility that Shadow of the Colossus does to have a screenshot mode that allows you to get creative and artistic yourself. But again, all of that is largely superficial to the real strengths of this game, and realistically Sony could have simply dumped the original PlayStation 2 version on us and it would still be every bit as essential. In fact, the work done on the game almost feels excessive and distracting from what people should be focused on when they play this game. Shadow of the Colossus is a masterpiece of storytelling, of restrained, minimalist gameplay, and of building emotion through interactivity. The game tells the story of our avatar, a young boy named Wander, who wants to save the life of a recently-deceased maiden, so he takes her to a “Forbidden Land”, where a deity-like being promises him that she can be saved if he goes around killing the colossi that inhabit the land, and is willing to make great personal sacrifices. At first it seems like a reasonable enough request that we, as Wander, accept it. After all, the whole ‘save the maiden’ plotline is one we are overly familiar with in video games, and when we first start playing Shadow of the Colossus, we’ve got no reason to doubt what the game is asking of us. We happily play along. It’s only about the midway point that a sense of unease about what we’re doing will set in. We have no other guide through this journey than the deity, who is less than forthcoming about the consequences of what we’re doing. There aren’t other people around to provide a counter view and suggest a different course of action. Significantly, not all of these colossi are even hostile. Some attack on sight, sure, but some passively wait for us to attack them. And all of them – even the aggressive ones - appear very much to be an important part of the nature we see around us. Desolate though the huge expanse of the Forbidden Land is, these creatures very much appear to be part of its equilibrium, and the horrific images we see as we kill these majestic and at times peaceful beasts becomes ever more distressing. It doesn’t help that as we kill these beasts our avatar starts to absorb their essence, and it changes him in a way that – if we continue to buy into the idea that this is a damsel in distress fairytale – starts to make him look very much like the villain. Slowly – and subtly at times – we’re led to question the assumptions that we go into Shadow of the Colossus with. It helps with the game’s impact that it’s comfortable with taking its time. Cut scenes tend to be long, and you tend to spend a lot of time roaming around a very empty world. At a very initial glance Shadow of the Colossus looks like it could have been Sony’s answer to Zelda (and indeed I remember numerous critics chalking it up as that on its initial release), but it’s not; the world is empty beyond the colossi “boss battles” and while both games enjoy turning those boss battles into puzzle-like experiences, tonally, those puzzle experiences are very different. Zelda’s are action-based. Shadow’s are slower, more methodical, and more intricate. At every stage the game encourages reflection and thought, which, given that at its very core it’s a moral debate, is the right way to go. Shadow of the Colossus could have easily slipped into being something too academic for its own good, with its rich and philosophically dense themes. It doesn’t, though. Rather than being dry, or dull, it’s deeply emotive, to the point that, three editions on, it can still move me to tears. This is particularly true with the one true human-like bond the game depicts throughout its entire run time. But then again The Neverending Story taught me much about the relationship between a boy and his horse, and in this game too the only “person” our hero has to rely on is his ever faithful horse, Agro. 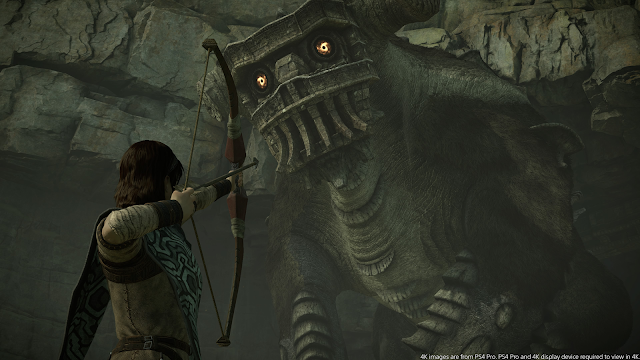 Agro has a mind of his own, and won’t always move the way the player wants him to – some would interpret that as poor game design, but in practice it’s a reflection of Agro being a character in his own right (a misunderstanding that would also plague the reception The Last Guardian received with its often-misbehaving griffin-like AI companion). But in the quieter moments the way the two move around the world together feels incredibly authentic and believable, and gives the game an important emotional connection and context in what is otherwise a largely barren world. Related reading: The Last Guardian, by the same studio, is also on PlayStation 4, and also a masterpiece. Matt's full review. 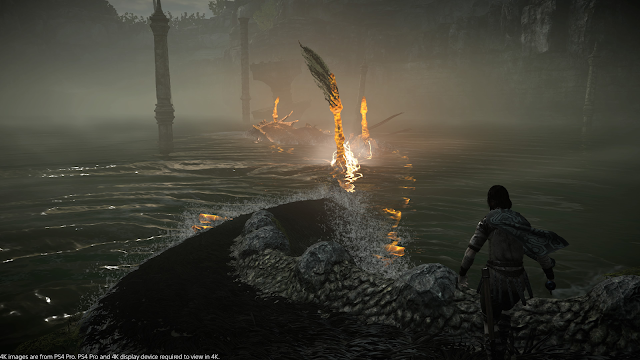 Fighting the battles with each colossus is a thrill, too, even if you’re not sure about the righteousness of doing so. 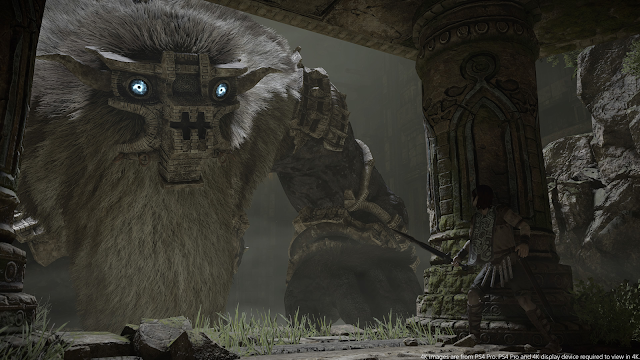 Each colossus has its own specific weak points, and is covered with climbable fur, platforms, or other bits and pieces of body that you can clamber about. The goal is to find a way to that colossus’ weak point and then stab that point, hard, with your sword. At the same time, of course, the colossus is trying to shake you off it, and then squish you with its feet, or other giant bits of weaponry. Overcoming these beasts requires timing (so you know when to try and dash across an appendage between efforts to knock you off), logic (working out the best route to the weak spot) and then a not inconsiderable level of gaming ability to actually execute on the strategy. Shadow of the Colossus isn’t difficult in the way that Dark Souls or whatever other game you consider to be the epitome of difficulty is, but it’s also not a cakewalk. That’s for the best, though. It hurts the accessibility of the game a little, but given the scale of the beasts that you’re tasked with fighting, it would have been quite disappointing if they weren’t able to back up their intimidating presence. 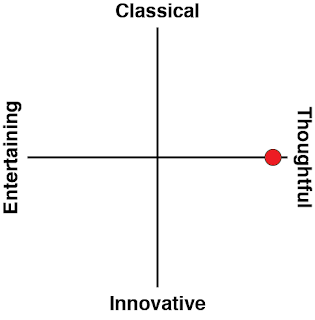 On top of the quality, emotive gameplay, is one of the most majestic musical scores ever written for a video game. 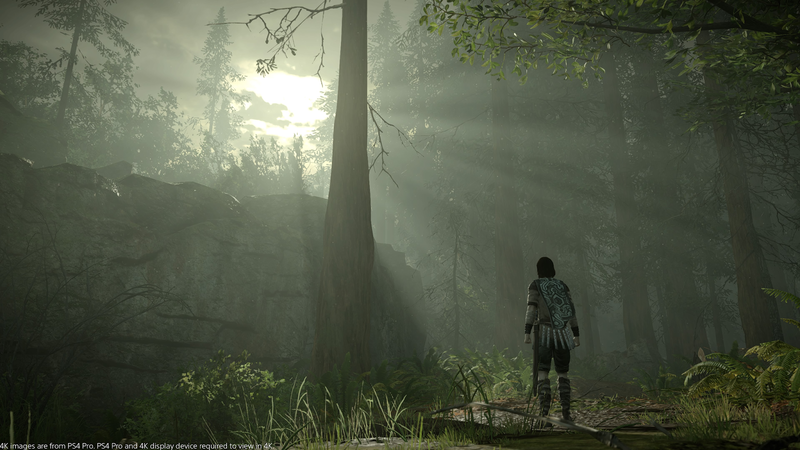 Shadow of the Colossus has a lot of quiet moments, which was relatively innovative back when the game was new (and games were generally expected to have persistent musical scores), and further encouraged players to enter a deeply reflective mindset. But when the music does pick up, it breathes such vibrancy and emotional gravitas into the game that can turn the most subtle moments into something of great poignancy. Shadow of the Colossus is, in a way, overwhelming. It’s not just that the beasts that you are fighting are so massive, and the challenge in taking them on with nothing but a sword and bow can, at first, seem monumental. 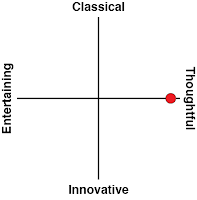 It’s overwhelming for its emotive power, its rich themes, and its uncompromising vision. There’s nothing genuinely like Shadow of the Colossus out there, and hopefully this new, pretty version, as superficial as that prettiness is to what makes the game so important, encourages a new generation of players to try it for themselves.